The Chelsea Jewish Nursing Home has been in continuous operation in Chelsea, MA since 1919. It is supported by the Chelsea Jewish Lifecare (CJL) which also runs 2 assisted living facilities, a home health care agency, a personal care agency, and a hospice. The visionary CEO of the organization is Barry Berman since 1976. In 2006, Barry proposed to build 10 new skilled nursing homes designed as specified by The Green House® Project. The 10 independent homes were built condo-style in America's first urban Green House® called the Leonard Florence Center for Living. Originally planned for all elders, Barry realized how special these homes would be and challenged his team to think of underserved populations who would benefit from this revolutionary lifestyle. MS and ALS were the early contenders. It was decided to visit an ALS Symposium to learn more about the needs of people with ALS (pALS). Six months prior, in October, 2006, Steve Saling received his diagnosis of ALS. 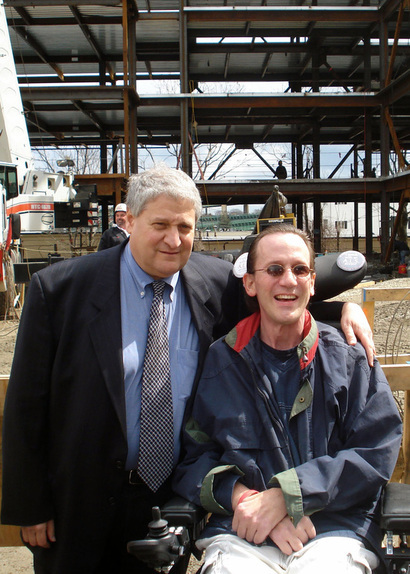 Steve was working as a licensed landscape architect designing public open space such as the parks above the Big Dig, ironically with a focus on making all places accessible to people with disabilities. He was going to this ALS Symposium specifically to learn about his future living options as a 38 year old single man with ALS. It was fate that Barry and Steve would meet and share a vision to do something that had never been done. In the May of 2008, Steve moved into the assisted living facility on the same property where the new Leonard Florence Center for Living would be built. He actively consulted with the architects offering his unique perspective as both a professional designer and a future resident of the home that would bear his name. In particular, Steve designed the automation system that would restore much of the independence of which ALS was robbing him. He contracted the custom automation software to ﻿Promixis, LLC﻿ to create the system now known as PEAC. Using readily available hardware and technology, PEAC has successfully returned total environmental control with the blink of an eye. The Steve Saling ALS Residence opened on March 11, 2010. The Grand Opening was held on August 13, 2010 and included a ribbon cutting by Governor Deval Patrick and his entire Cabinet and a personal message from Stephen Hawking. Steve and Barry have presented the ALS Residence at the 21st International Symposium on ALS/MND in Orlando, FL, the 2011 Leading Age National Conference in Washington DC, and the first ever Products & Technologies that Change People's Lives Conference in Boston, MA, among others. Over 1,000 people from all over America and the world have toured the ALS Residence and Barry and Steve regularly reach out to organizations in the hope that others will be inspired to provide a home for pALS and others so that life is more about living than just survival.